Network configurations or network setup for small business, home office, home internet sharing for file and print sharing can be a confusing and time consuming task to setup. If you haven’t had much experience with networking Windows PC’s before you could easily spend a weekend getting it all configured the way you want. This is especially true when you have a mixture of operating systems on your machines such as Vista, XP and 98, Win7 and Win8 and Mac. Networking has become dramatically easier and often will happen quite automatically between XP and Vista PC’s however it can get tricky when you have internet security software running, firewalls and file permissions. In the 1990’s we were setting up networks with friends for multiplayer gaming of classics like Doom and now we are more interested in sharing printers, having access to MP3 collections and being all connected to the internet simultaneously. 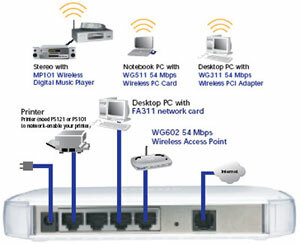 We can also help with wireless networking. If you need a hand with your home or office network please call on 20 4950 1140 and we can book a time to have a look at it for you and help sort it out.